While excellent customer service and brand awareness are crucial to fleet success, it all comes down to dollars and cents in the end. If your fleet isn’t financially stable and sustainable, it’s not going to last long in what is a highly competitive industry. As a fleet manager, you must reduce fleet costs for improved efficiency and profitability. In this blog from the fleet management software experts at Skypatrol, we’ll discuss ways you can reduce costs throughout your fleet and improve the stability of your business for years to come. More vehicles means more fuel expenses, depreciation losses, driver salaries, and vehicle repair bills. 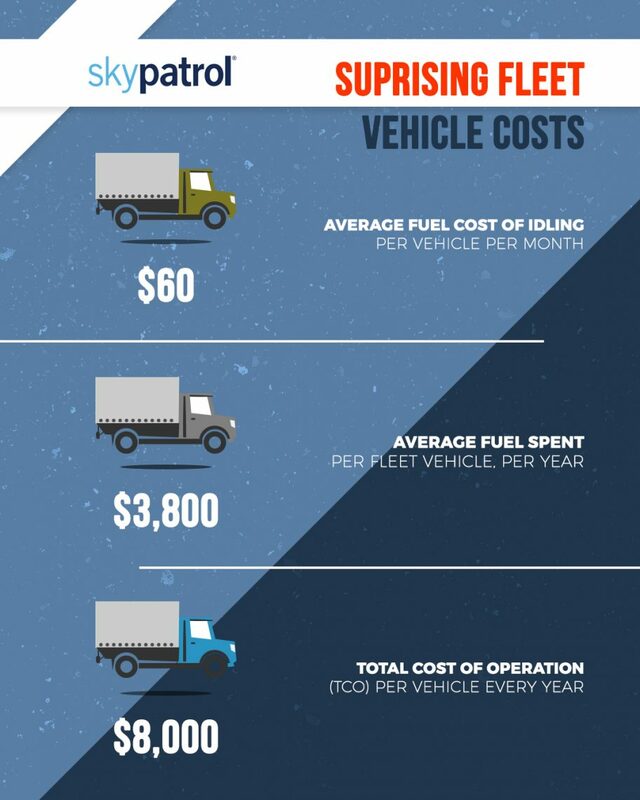 All of these costs factor into your vehicle’s total cost of ownership (TCO), which can range anywhere from $5,000 to $8,000 per vehicle, per year. Eliminate 10 vehicles from your fleet, and you’re saving $50,000 to $80,000 per year — savings that can help you with large-scale marketing efforts, better pay for drivers, and capital purchasing. It’s true — shrinking your fleet might add more work for your current drivers, and increase the operational costs of the vehicles you keep. However, you’ll still see a decrease in overall fleet operating costs, and that extra windfall could be used to keep your vehicles in great shape and reward your drivers for their hard work. It doesn’t matter how many vehicles you cut from your fleet — there’s some huge cost reduction potential here. Vehicles lose value by the mile. Drive your vehicles farther to get the job done, and you’re paying more for fuel and increasing your depreciation rate (the biggest overall expense for fleets). However, if you can find a way to make more deliveries in a smaller service area, you’re generating more revenue while putting less mileage on your vehicles. That’s more money in and less money out. Add in the fact that a smaller service area leads to fewer headaches when a vehicle breaks down, and you have a cost-cutting strategy that’s great for your books and your day-to-day operations. It’s hard to make sensible and profitable decisions for your fleet when you don’t have any data to provide context. Without a way to store fleet metrics on mileage, vehicle service, revenue, driver behavior, and the like, and you won’t be able to recognize key patterns that can help you steer your fleet in the right direction. Fortunately, that’s where Skypatrol’s Fleet Command can help. Fleet Command is a fleet management system with GPS that stores critical fleet data and driver behavior in an easy-to-use, web-based interface — organize and interpret data to make the best cost-cutting decisions for your fleet, and take advantage of GPS fleet tracking technology to improve driver behavior and make everyone in your company more efficient and more profitable. The time for a more stable and profitable fleet is now — schedule a demo of Fleet Command today.